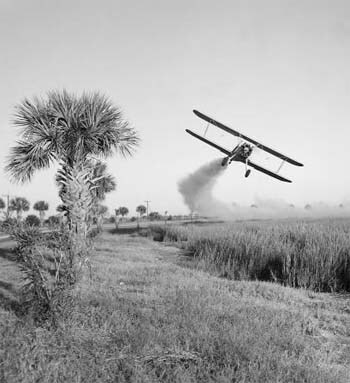 Prior to World War II there was some use of chemicals like heavy metal compounds (lead, mercury, arsenic) to preserve collections but experimentation with nerve gasses during World War II gave rise to a new crop of organic compounds that were found to have insecticidal qualities including carbamates, organophosphates and organochlorines such as DDT. We became increasingly reliant on their use as they increased our food production and removed insects that carried diseases. But this ultimately lead to a chemical crisis, where higher and higher doses of chemicals became necessary as insects became resistant to the chemicals. Rachel Carson’s 1962 book, Silent Spring, brought awareness of the harm that chemicals like DDT had created and prompted the start of the environmental movement culminating in the formation of the EPA in 1970. The term Integrated Pest Management was first used in agriculture beginning in the 1970’s in response to growing knowledge about the negative side-effects of pesticide overuse. The approach emphasized the integration of pest biology and cultural practices in controlling insect pests in crops. The first literature on IPM in non-agricultural settings came in the early 1980’s with publications by H. and W. Olkowski (founders of the Bio-Integral Resource Center – BIRC) including a training manual written for the National Park Service. The term was used soon after in museums as a replacement for the term “pest control”. New ways of dealing with pests were promoted partly by the withdrawal of many common chemicals from use, as well as general trends in health and safety. In cultural institutions the term IPM also indicated the need to expand the pool of alternative control methods by “integrating” pest management into collection care practices. Although “IPM” represents a specific strategy, it is often used more loosely to describe modern trends that promote any measures other than the use of pesticides and toxic fumigant gases.